himself the enemy fire, and foiling the maneuvers of the adversary by making them mistake the above-mentioned officer for a cat. At the front since his birth” (Baker, Animal War Heroes, 69). Pitoutchi was born in the Belgian trenches. His mother was killed before the litter of eight kittens had opened their eyes. Lieutenant Lekeux was on duty when he heard the kittens crying and found a group of soldiers around a small basket of kittens. He decided to take them and nurse them. He tried the best he could to put drops of milk into their mouths, but the kittens would not drink it. By the next evening, all but one kitten had died. Only the little white kitten would drink the milk, and he survived. onto Lekeux’s shoulder and ride. The incident about which Lekeux wrote the report happened as follows. The Germans were up to something for a number of days, throwing dirt near a thicket. Lekeux was concerned and decided to investigate what was going on, so with Pitoutchi on his shoulder, he left the trenches to investigate. As Lekeux reached a spot near the German lines, he saw that they were digging a new trench. He hid himself in a shell hole nearby to make a sketch of the German works. He was so absorbed in his sketch that he did not notice three approaching German soldiers on patrol. When he finally realized his situation, it was too late to run. If he left the hole he would be shot, and if he stayed he would be bayoneted, because it was obvious that the Germans had seen him crawl into the shell hole. He decided to lie very still, hoping that the Germans would not see him, but unfortunately he heard one soldier say, “He’s in the hole,” so he knew he had been seen. When Pitoutchi heard the German say that, he jumped out of the hole onto a piece of timber. The Germans were startled and fired two shots at Pitoutchi. However, as frightened as he was, Pitoutchi was not hit, and he jumped back into the hole with his beloved Lekeux. The Germans laughed and joked that they had mistaken a cat for a man and left. Lekeux finished his drawings and returned to the Belgian lines with Pitoutchi on his shoulder. Excerpted from Susan Bulanda’s fascinating book Soldiers in Fur and Feathers – The Animals that Served in World War I – Allied Forces. 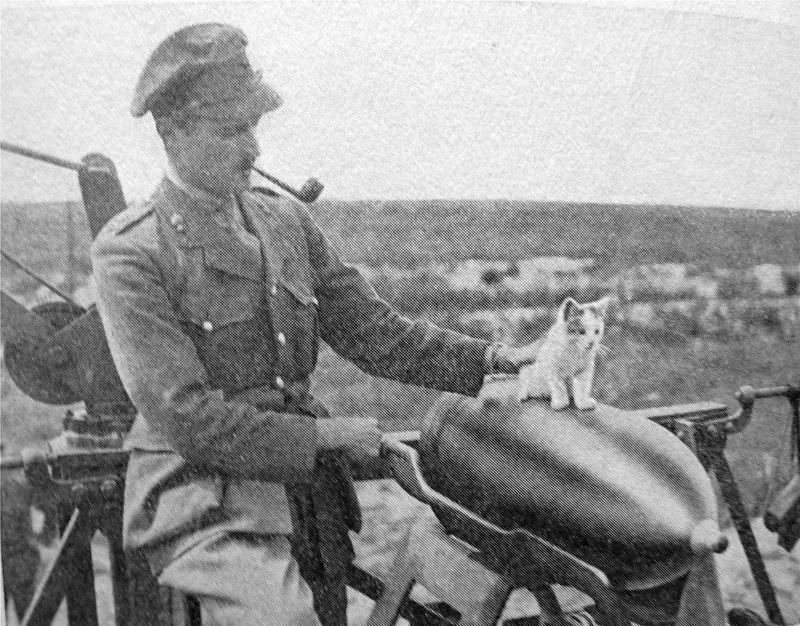 This entry was posted in Animals in World War I and tagged alpine publications, animals in WWI, cat mascot in WWI, cat who saved his owner's life in WWI, cats in WWI, mascots in WWI. Bookmark the permalink.